wig4usc wrote: Why choose??? Do both!! I've decided to go myself at midnight, then go again w/ my hubby later. He's not interested in the midnight show and it gives me the perfect justification to see it more than once! I won passes to see an advanced screening of New Moon! I am so psyched. I will see it tomorrow night. Holy cow, I could not be more thrilled! I just need a buddy to come with me! Yeah, well, I get to see it with a possible ear infection that has yet to be confirmed. I've honestly come to terms with the movies not be close enough to the books because of HP; I mean, I heard from some that the Twilight movie was good, and from others that it was pretty bad, my expectations for the movie were pretty low. With this one, however, it is looking better then the last and I do hope it's better. Wish i could go to the midnight one.... Off straight after school friday though, cant wait . Bouncing off the walls! Well I've seen it and I enjoyed it more than I enjoy watching Twilight these days as they stayed much truer to the book. I hope you all enjoy it and laugh out loud at the re-branded 'Crosshairs' like I did. 31 hours until I see New Moon!!!!! Just saw the movie! It was awesome. Chris Wietz did an amazing job. It certainly exceeded my expetations. LOVED IT! LOVED IT! LOVED IT! LOVED IT! LOVED IT! Just booked my tickets to see it again tomorrow night. Who else has seen the movie? Is there a discussion thread in here somewhere so we don't give away spoilers? I saw it 12 hours ago, at the midnight showing. They showed 'Twilight' at 10 and then 'New Moon' at 00.01. It was great to see that everyone there (and there were a lot of people) was in their twenties and thirties - I was kind of worried it'd be filled with teenagers and I'd feel totally out of place. I'm going to see it again in 2 hours. I always have to see this kind of movie twice to really form an opinion. At the moment I feel pretty positive about it though, it was really good! The book is not my favourite one so I didn't have very high expectations - it was certainly better than I thought it would be. What I did feel is that they really rushed things, there was so much information to get through that they hurried through everything. That may be because I've only seen it once though. I agree - New Moon was my least favourite book of the saga but I still really enjoyed the movie. I can see why some critics have said it is a bridging movie to set up for Eclipse, because it really is. 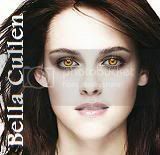 Still they had to establish the relationship between Bella and Jacob and introduce us to the wolves etc. I MADE MY SHIRT FOR TOMORROW!!!! 10:30AM!